Los Angeles:: Stephanie Gibbs,, 2018.. Edition of 16 (8 deluxe, 8 standard). Standard: Enumerations book only. 3.5 x 7.5"; 24 punch-card leaves and 14 graph-paper leaves. Digitally printed onto unused computer punch cards. Trigonometry screenprints printed on vintage graph paper. Design, screenprinting, pastepapers, and binding by Stephanie Gibbs. Bound in pastepaper over boards with cloth spine. Title in silver on spine. Numbered. Initialed by the artist. Deluxe: 4 x 8 x 2" clamshell box containing A Primer, Slide Rule, Enumerations, Trigonometry screenprints, diskettes, magnetic core memory diagram. Box cloth-covered with punch card on top lid and title on spine. Ribbon lifts. Stephanie Gibbs: "The text of 'Enumerations' is the 'Note' in which Ada Lovelace, mathematically trained daughter of Lord Byron, describes Charles Babbage's Analytical Engine. This first computer was based on Jacquard looms and the 'Note' references a specific encyclopedia article on loom technology. "The trigonometry imagery is from 'Cyclopaedia: or, An Universal Dictionary of Arts and Sciences', Ephraim Chambers, London, 1728. The trigonometry screenprints in the book were printed on vintage graph paper from the United States Department of Agriculture." 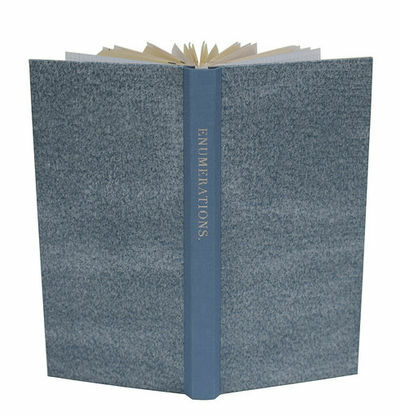 The deluxe copies of 'Enumerations' contain representations of different forms of memory associated with the development of computing - trigonometry formulas, punched cards, slide rule, magnetic core memory. The slide rule sample is a design based on 20th century models using logarithmic tables designed by John J.G. Savard. "A slide rule can be considered a form of external memory, an early computer. The scales on a slide rule are logarithmic, in that the spacing between divisions (the lines on the scale) become closer together as the value increases, permitting multiplication and division." The magnetic core memory diagram is an embroidery sampler to demonstrate the "bridge of textiles and computers. Magnetic-core memory was the predominant form of computer memory between 1955 and 1975. Raytheon wove MIT-designed software into core rope memory using Massachusetts-based textile factories." The two diskettes enclosed contain "programs related to engineering, computer science, and the humanities, representing the broad range of uses to which computers are now applied."